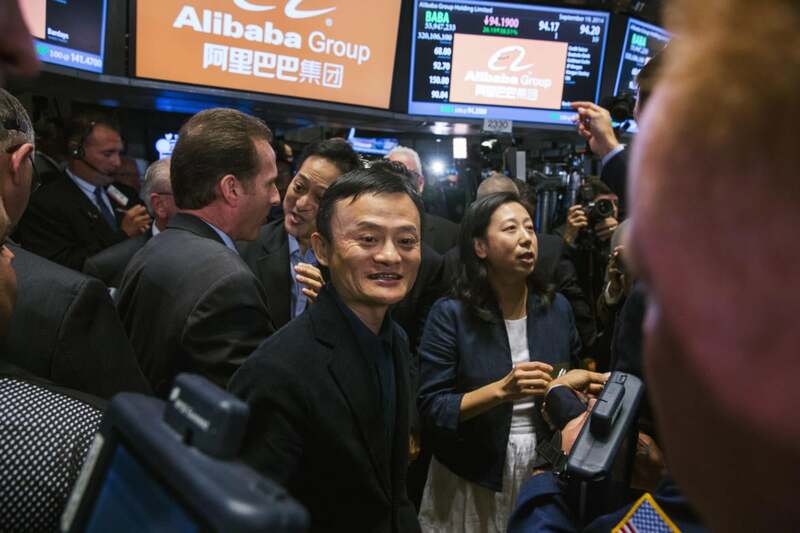 In their first day of trading, shares of Alibaba stock opened at $92.70 on the New York Stock Exchange on Friday, an increase of more than 35 percent over the $68 initial public offering price. The company raised $21.8 billion in its U.S. IPO, making it one of the largest IPOs ever. It's close to the historic $22 billion raised by the Agricultural Bank of China in 2010, and beats the $18 billion raised by Visa in 2008. Alibaba shares didn't begin trading until at least a couple of hours after the opening bell. Listed under the symbol BABA, Alibaba shares were trading slightly lower around $90 in the early afternoon. The stock ended the day with a price of $93.89. Alibaba is an e-commerce behemoth in China, but it's looking to grow its business internationally, perhaps beyond e-commerce in the pursuit of new consumer data. The company was founded in 1999 by Jack Ma. Two of its largest consumer shopping sites are Tmall and Taobao, though it recently opened a new online shop in the U.S. called 11Main.